Books make great gifts. Since the holiday season is quickly approaching, consider giving the “gift of reading”. 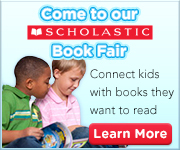 Lincoln Elementary School will hosts its annual book fair beginning Thursday, October 22, 2015. The fair will be held in the school library during regular attendance hours. Parents are invited to attend the fair on Thursday, October 29, 2015 during Parent/Teacher Conference. We will also host an online fair beginning Saturday, October 17, 2015 through Friday, October 30, 2015. To shop online, click here. Each purchase will help us reach our goal of 83,160 minutes of reading.